This week at REI of Virginia our guest speaker will be local author / investor Paul Moore. 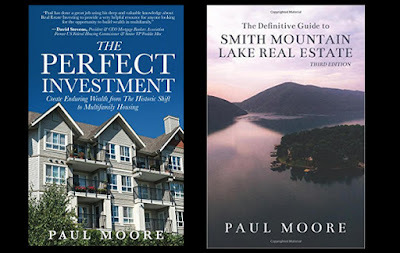 Paul wrote a couple real estate books including one on Smith Mountain Lake real estate and another on what he calls “The Perfect Investment”, multifamily investing. I just so happen to agree with Paul on multifamily being the perfect investment as most of my portfolio consists of apartments. This is going to be an awesome meeting that I’ve been looking forward to. So often you read various guru books that are located in different states with different laws and what is suggested doesn’t work the same or at all here. You can’t beat advice from local real estate experts as what they teach is extremely relevant to our area. Cancel any plans you have as you don’t want to miss this meeting. Free Windows And Paint Throughout Your House!! !